The world is abuzz with talk of Bitcoin and cryptocurrencies: their meteoric rises and drops in value, their potential to displace our currencies. But underlying the hype is blockchain, an historic advance in software architecture that has implications far beyond currency. In the realm of business process automation, blockchain solves one of the fundamental problems facing digital business initiatives: secure, transparent, authentic and credible execution of business processes across multiple parties who have no particular trust or familiarity with each other. When business process automation was strictly internally focused, the issue of trust was minor. Inside a single company, most people have some element of trust in each other. With the realization that internal efficiency and customer experience can be optimize by extending processes externally to customers, suppliers, and partners; the issue of trust becomes paramount. 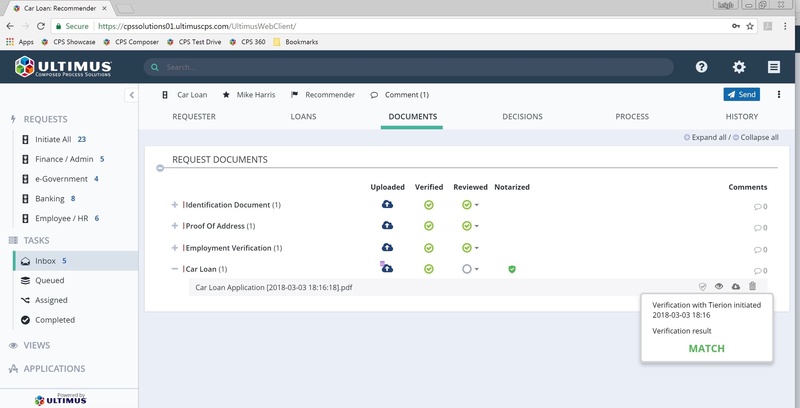 Quite simply, since the outcome of a digital business process is document or decision – for instance, a loan agreement, an employment contract, a purchase order, a bid or quote, or a report filed with a regulatory body – there needs to be an exceptionally strong method of protecting documents (or the entire process instance) from being altered or stolen. In the world of paper documents, there were many ways to verify a document’s authenticity – an embossed notary seal, watermarks, and/or signatures. But digital documents and information can be modified and copied in undetectable ways. Blockchain enables all parties to prove in the future that a document or process instance is that same as what was presented to the distributed blockchain ledger at a specific prior point in time. The question for digital business initiatives is not how or whether blockchain works – it clearly does – but how to overcome the practical challenges faced when trying to use it. These practical challenges include scalability (the time required to anchor information is too slow), cost (anchoring data is expensive in volume), and accuracy (current timestamp accuracy is +- 2 hours); challenges that have now been overcome with anchoring protocols such as Chainpoint. The remaining obstacle is how to blockchain-enable enterprise applications in a way that is fast, cost effective, usable, and manageable. Composed Process Solutions (CPS), Ultimus’ novel, generative low-code development platform, offers a compelling answer that allows organizations to become early adopters in this fast-moving space. At the core of CPS is a common domain model for all process- and case-related business software applications – a single mapping of their commonalities and variations points. This approach allows universal requirements – solution architecture, structure, design, data management, mobility, language localization, and many others - to be developed once in a standardized way that incorporates Ultimus’ extensive knowledge of best practices instead of once per company, per project, or per process in non-standard ways. 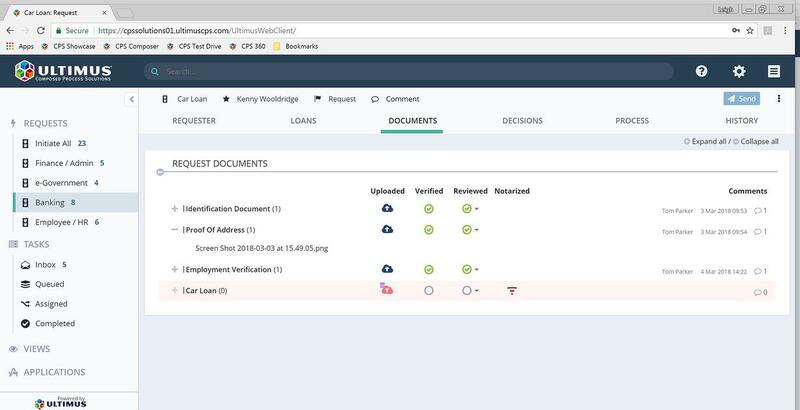 Other common requirements - ERP, SMS, social media, AI, and GIS integrations; formatting validations; the ability to waive rules – and now blockchain - are also developed once and can be used when appropriate in any CPS solution. The result: individual process automation applications and application families can be developed and managed with exceptional speed, consistency, and usability – and without complexity. 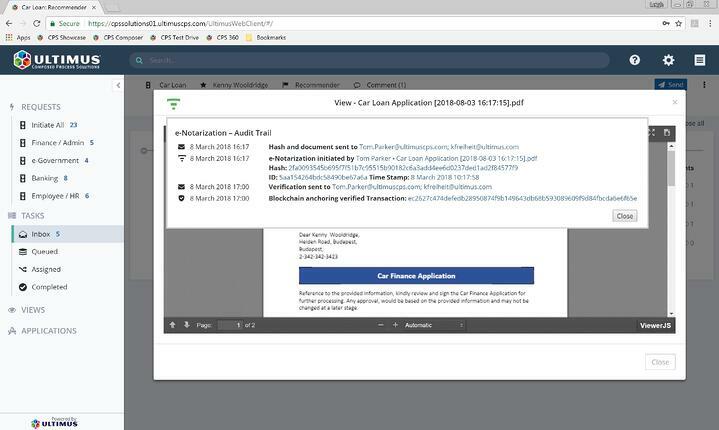 The screenshots below show an Ultimus Composed Process Solution, in this case a car loan process, that has been blockchain-enabled. 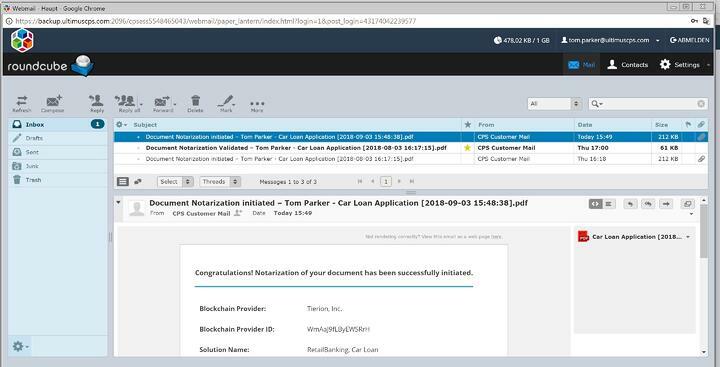 In this example, the solution description stipulates that the Car Loan application document must be “e-notarized”, that is, confirmed by all parties and anchored to the blockchain. 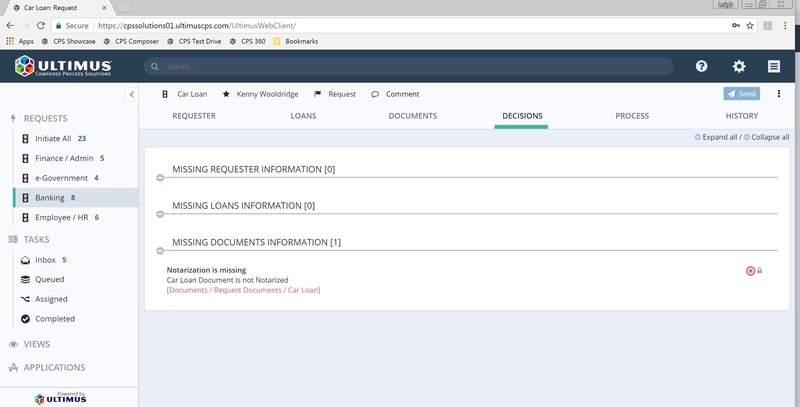 Using CPS, all blockchain-related aspects – the user interfaces, anchor validations, credentials and e-stamping, communications with the anchoring service and blockchain, blockchain history, and match proof validation – are implemented automatically simply by indicating that the document “Car Loan” must be anchored to the blockchain at the “Request” step. The result: consistently, quickly, and easily creating immutable blockchain proof of validity for any and all process data. Icon indicates a required document has not been e-notarized. Automatic process validation: process cannot proceed without e-notarization. 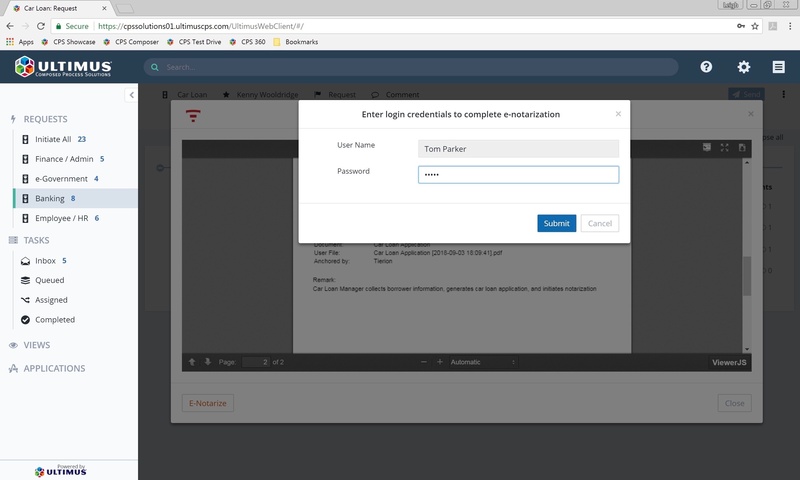 User enters login credentials to e-notarize a document. 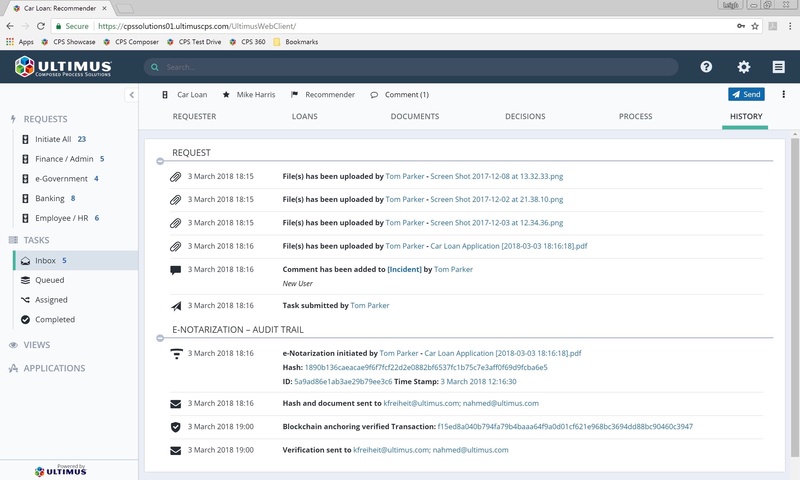 Automatically created history of e-notarization and blockchain anchoring transactions. Automatically created e-notarization audit-trail for process document. Automatically created system generated email containing proof information.